Northcote painted many self-portraits. Here, he depicts himself with one hand holding a palette and brushes. The other hand is raised to his forehead as if seeking inspiration, the sort of gesture sometimes found in portraiture of the Romantic period. This portrait was painted in London at a time when he was trying his hand at genre and history painting. Theatre proprietor and postal reformer John Palmer runs the first mail coach in England, between Bristol and London. A three day journey is now completed in 16 hours. Commutation Act reduces punitive duties on tea to combat smuggling. Aeronaut James Sadler makes the first hot air balloon flight in Britain, from Oxford to Woodeaton. Chemist Henry Cavendish's paper Experiments on Air reveals the composition of water. 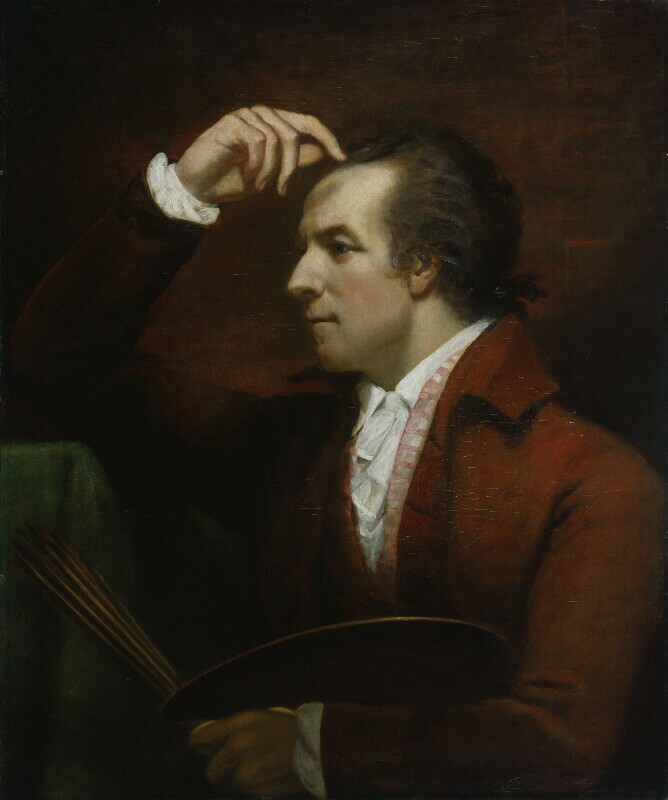 Joshua Reynolds succeeds Allan Ramsay as Painter to the King. Thomas Jefferson's Land Ordinance passed by the United States' Continental Congress, coming into effect the following year. It allows for the sale of land in the largely unmapped west of the country. Britain receives its first bales of cotton from the United States since before the War of American Independence. William Pitt's India Act creates a Board of Control to oversee the affairs of the British East India Company and centralise power.